Our life is transfigured as we grow in the Love of God, as we become more like Christ by sharing in his victory over selfishness, sin, suffering and even death. Our journey of faith is a journey of light … a journey of darkness undertaken in light of God’s promises to us, in light of the resurrection, and in light of the coming kingdom! The journey of faith is by nature darkness to the one walking in faith, but for all around, as we walk with Jesus, we ourselves become light for the world. Last week we heard how the Spirit drove Jesus into the desert, and how we share in Jesus’ victory over the three temptations to selfishness that lead us to sin. This week the Spirit reveals that Jesus has an intimate relationship with his Father — a relationship shrouded in mystery and one we ourselves are called to enter. The mystery from which explodes the promise of eternal life. In the Gospel, we read how Jesus revealed his divine nature to strengthen his closest disciples; disciples whose own journey of faith was drawing nearer. Like Jesus, like the disciples, all Christians must enter this mystery of our origin because we are all children of God. Jesus frames this journey around his own foreseeable death and resurrection. Hence the paradox – that we are called to be light bearers like Jesus precisely at those moments our lives are plunged into darkness, and transfixed by the Cross of our own mortality. We too can foresee that. 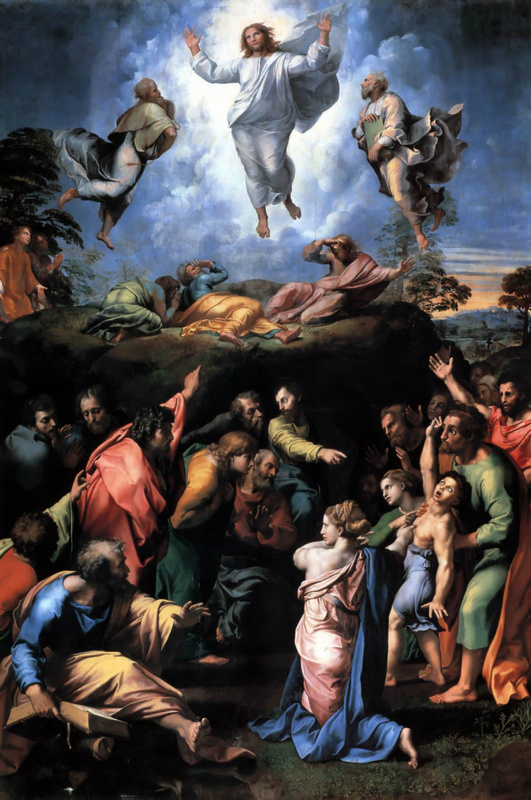 It’s only by ‘walking’ with Jesus in faith, in the face of death, that the significance of the transfiguration will be made known in our life. It will be in the darkness of faith, at the moment of death, and apparently all alone, God himself promises to draw us into God’s own wonderful light. What a magnificent mystery. On this side of life, we miss it. On the side of eternal life, we are simply transformed. A reflection of this momentous journey happens in this life, for the journey begins in this life! And although we walk by faith, and in darkness, we ourselves become a light for others to see. This journey is epitomised by Jesus himself, who, upon the Cross cried out to the Father “Why have you abandoned me?” In that moment of supreme love and faith, he became the light of the world. Jesus has created a new covenant and has given us his Spirit that makes us sharers in his victory over death; making us sons and daughters of God whose homeland is in heaven. Now it is our vocation is to bring his light into the world. There are parts of the journey that can only be undertaken in darkness with faith alone as a guide, but be consoled because on this journey we walk in the footsteps of Jesus in the sure hope of the resurrection. In times of darkness rejoice –Jesus is walking with you, your heart is expanding and growing in love, your faith is becoming stronger, your hope more certain. And to all around you your face will become ever more radiant with the love of God for all to see.